If you know 1920s men's suit fashions, then you know about Blu Martini by Falcone Men's Suits. Falcone men's 1920s style suits are made with the latest fabrics and styles using old fashioned hand finishing. These are the type of fashion suits that are for men who like bold unconventional style while wearing Stacy Adams Shoes so when they go out the spot light is on them and them only. 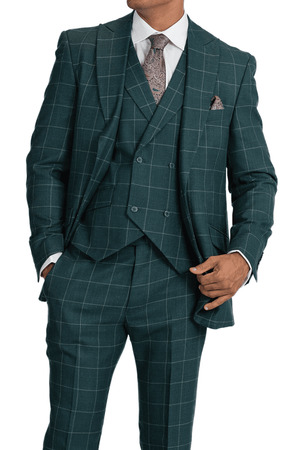 This green windowpane 3 piece suit comes with a peaked lapel vest. The Jacket is 32 inches long and is Regular fit so you know you will look great. The pants are flat front style with hidden elastic waistband and ready for hemming. Made of fine super 150s poly/rayon fabric.